The paper is titled “Higher-Order Inter-chromosomal Hubs Shape 3D Genome Organization in the Nucleus.” In addition to Quinodoz and Guttman, Caltech co-authors are postdoctoral scholar Noah Ollikainen; research associates Ali Palla, Elizabeth Detmar, and Vickie Trinh; former visiting student Jan Marten Schmidt; computational biologist Mason Lai (BS ’09); former staff scientist Alexander Shishkin; graduate students Prashant Bhat and Yodai Takei; former research associate Erik Aznauryan; senior research scientist Amy Chow; and research professor Long Cai. Additional co-authors are Barbara Tabak, Patrick McDonel, and Manuel Garber of the University of Massachusetts, Pamela Russell of the Colorado School of Public Health, Christine Cheng of Boston University, and Marko Jovanovic of Columbia University. Funding was provided by the Howard Hughes Medical Institute Gilliam Fellowships for Advanced Study, the National Science Foundation, the National Institute of General Medical Sciences, the UCLA-Caltech Medical Scientist Training Program, the National Institutes of Health, the National Human Genome Research Institute, the New York Stem Cell Foundation, the Sontag Foundation, and Caltech. 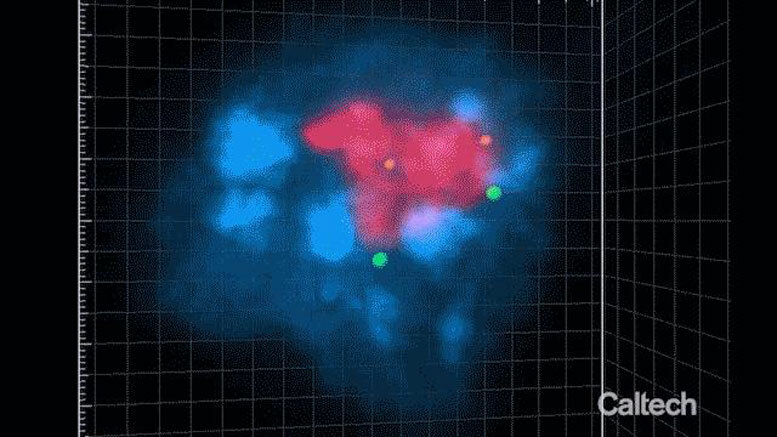 Be the first to comment on "Biologists Create 3D Maps of DNA Within the Innermost Parts of a Cell"